Moving has a way of showing you all your stuff and forcing you to make some tough decisions about what to keep and what to throw away. When my family was packing up our life to move halfway across the country, I came across one box of stuff that I just couldn’t part with. It was my doggie and blankie — my childhood security pets. Haven’t we all had one of these at some point? My kids had specific pacifiers when they were babies, and each have a bear that went with us almost everywhere. I have had many a panic attack over misplacing those precious bears! And oh, the anxiety that ensued when it was time for them to go in the washing machine! And then there was the time that my daughter heroically saved her brother’s bear from being kidnapped! We still talk about that dreadful day. “The Day We Almost Lost Bear.” Let me tell you, all fear of strangers disappears when one’s bear is on the line. But I digress. 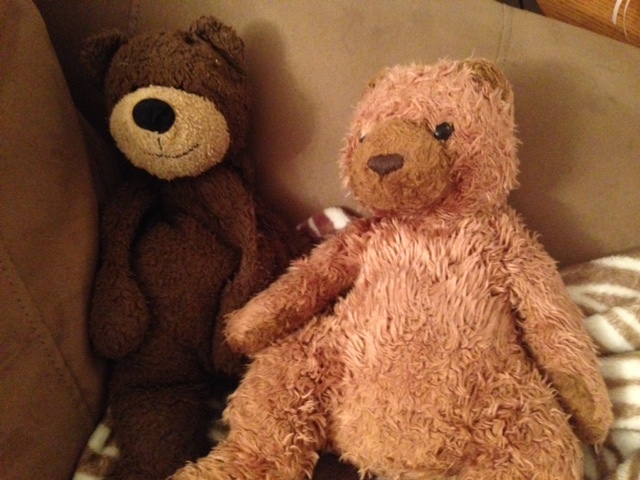 While we may give up our stuffed animals at some point over time (or at least tuck them away in a closet! ), it seems that we just replace them with more socially acceptable items. Items that make us feel safe and/or accepted, like a nice house, or a job with a nice retirement plan. Sometimes it’s not even an item, but just the comfort of our routine. Doing what we always do because it is what we know. I’ve been reading a great book by Mark Batterson called Wild Goose Chase. He reminded me that this type of thing has been going on since the beginning. He retold the story of Moses and his staff. Moses was a shepherd, so this staff went with him everywhere. It was his protection. It was his identity. And then God told him to throw down his staff. When he did, it turned into a snake. God told him to pick it up by the tail, and it turned back into a staff again. It was as if God was showing Moses that this staff doesn’t define him. God can make it into whatever He wants to. Those words leapt off the page at me as a perfect explanation of my recent choices. My staff was my house in Kansas. It was a big, beautiful symbol of security (complete with alarm system and video surveillance cameras!). It represented my identity – the perfect life I had built trying to please society. An identity that was threatening to destroy us behind the scenes and was holding us back from exploring new goals and purposes. I didn’t want to let it go, but I could intensely feel God telling me to throw it down. The house, our lifestyle, my career. Everything. It was so intense that I was literally jolted awake twice. The first time, I awoke abruptly with these words in my heart: You need to move to Florida NOW. In general, that wasn’t too hard to swallow. I despised Kansas winters and have always been drawn to the beach. Plus, I have relatives in Florida. But of course, I started second guessing this as just a selfish desire to live in paradise. The second time I was jolted awake, I was struggling with letting go of my career. I wasn’t finding anything in Florida worth leaving for, so maybe this really was crazy. But I awoke abruptly with instructions on exactly where to search for a new job, and at 3:30 in the morning found a perfect job listing that had just been posted the day before. I often find it hard to explain why I needed to sell my house, quit my job, and move to Florida. Couldn’t I just change my perspective a bit and stop holding these things so closely? Or maybe I could downsize, but stay in Kansas with my good job, our family and friends, etc. It certainly would have been easier on everyone if we had stayed. But this lifestyle had become my security blanket instead of God. He was telling me that in order to really trust Him to provide for me and my family, I had to let go of my security blanket and lean on Him instead. And I knew in my heart that a change in perspective this big would need something big to make it stick. Staying comfortably wrapped in my multiple security blankets would have made it too easy to fall back away from trusting God. I would have gone right back to trusting only myself. Real change requires real action. Please don’t misunderstand me. I’m not saying everyone needs to sell their house, quit their job, and move across the country in order to gain perspective. For some, it’s as simple as going on vacation or on a mission trip. For some, it’s only changing roles within the same company. But for everyone, it means evaluating your life and making sure God is your only staff. If you find you have another staff or security blanket, ask yourself if you are willing to throw it down. I was scared to sell my big, beautiful, perfect house. I was scared to quit my amazing job. I was scared to move away from my family and friends and everything I knew and loved. But I heard God whispering to me, “I will be with you.” I didn’t need to doubt or fear or question this. God was with me. God would help me make it happen. God would provide. And when I threw down my staff, He showed me miracles, just like he did for Moses. He gave us the strength to quickly prep our house for sale, in a neighborhood not known for quick sales, and sold our house in one day. He helped me find a great job, and He placed it on my employers’ hearts to hold that job an extra month until we could get moved. He helped us find the perfect place to live from 1500 miles away. He led us to the exact right church in our new town. I could go on and on and on. When I started really trusting God, more things fell perfectly into place for us in the span of 3 months than we had accomplished on our own in 15 years. This wasn’t some selfish desire. This was direction from God. God calls us to throw down our staff, our security blanket, and follow Him instead. Throw it down. Let it go. Outside of the safety bubble is a world full of amazing miracles for those who trust God to provide. Don’t jump off the ledge alone. Ask Him for guidance, wait for His instruction, then hold His hand to do it. He’s whispering, “I will be with you.” And He is. Always. Thank you! Your words blessed me & gave me encouragement for my journey! !